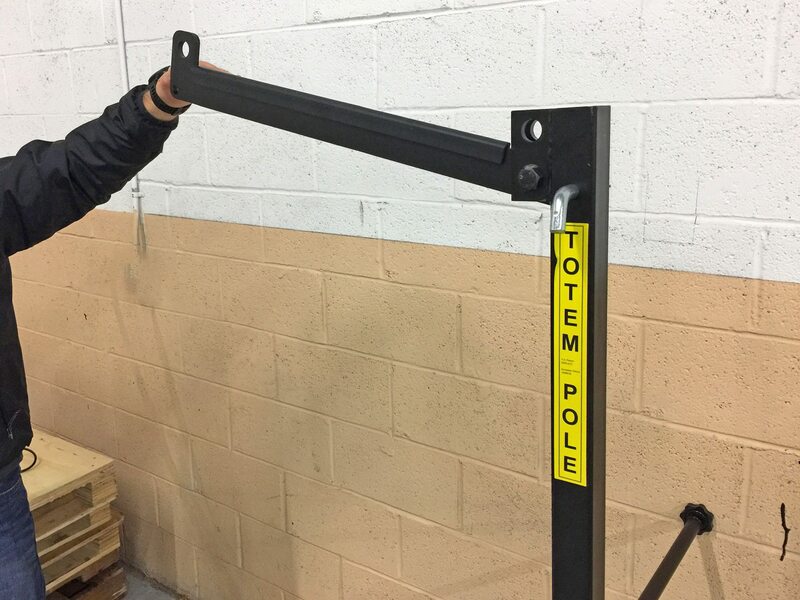 Overall Height Assembled: 71.5" Width (Max Outside Width): 51.5" Front-Wheel-Catcher (Usable Rack Length): 21.25" Max Insertable Hitch Length: 12" Max Depth (Projection Back from Hitch): 39"
Anyway, the father in this family designed the original Totem Pole rack and eventually launched a company with his brother to sell them to others. 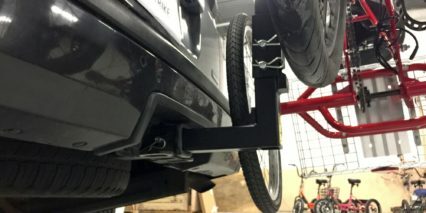 As you might imagine, the rack was getting a lot of curious looks and interest from people as they used it around town. From what I can tell searching the web and speaking with the founders, their early rack designs didn’t secure the lower wheel of the bikes the way this newer version does and the bikes would sort of cross at the bottom, pedals, cranks and disc brakes would collide a bit and the whole bunch of bikes could swing forward and back which could bump the back of the car. 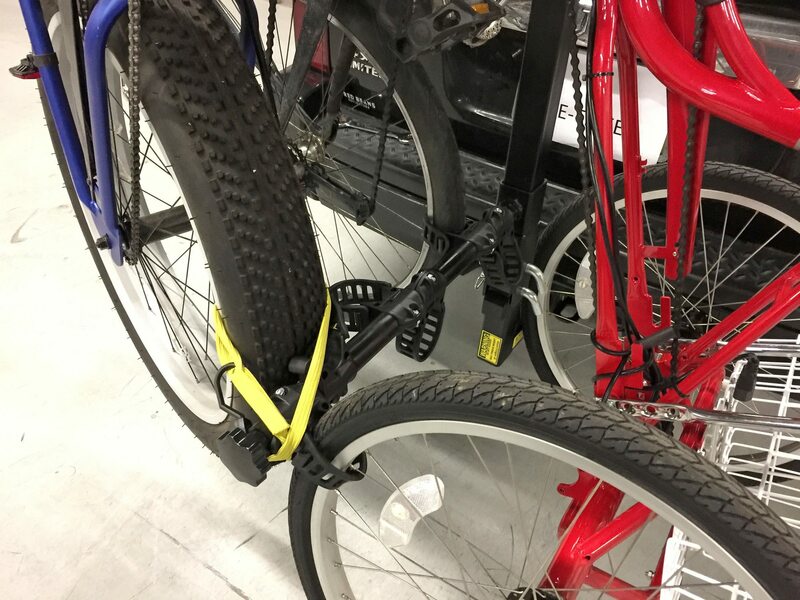 Now, with a horizontal cross bar protecting the back of the car, six rubber band loops for securing the wheels (instead of letting them cross) and a bunch of included bright yellow bungee cords the bikes are much more secure and there’s less potential for any kind of movement or scraping. 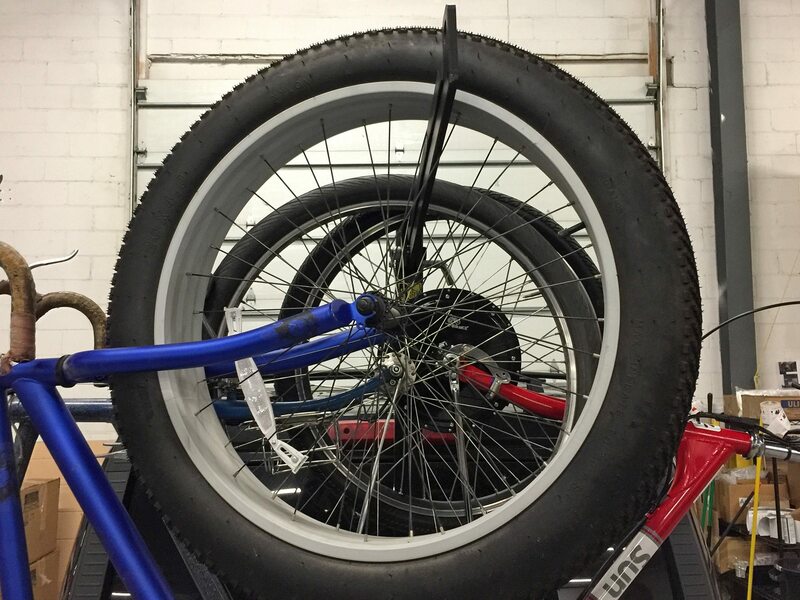 Another lesson from the early years was the need for a vertical extender because some cars have hitches that aren’t as high off the ground and the rear wheels for each bike could sometimes hang low, making contact with the street at the approach to hills and steep driveways or getting too close to the exhaust pipe (don’t let those tires melt!) the final upgrade they made was a swivel design at the base of the rack allowing it to tip back so you can open the rear hatch or window of the car. 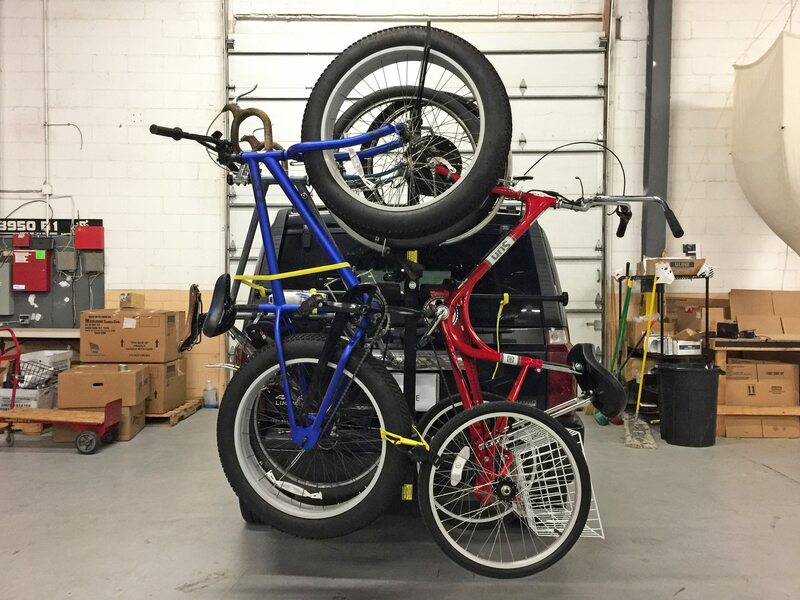 This last feature might be a two-person affair if the rack has bikes on it. The rack has come a long way and while those rubber bungee cords increase the visual footprint a bit, I’d probably still tie some red rags to the back-most bikes and adhere some reflective stickers to the rack tubing since it’s black. 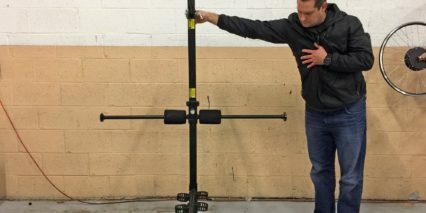 The Totem Pole bike rack was quite a bit taller than the SUV we installed it on for this review and that presents some aerodynamic drag as well as the possibility of ceiling or overhang scraping. Watch those parking garages guys, your home garage and drive-thru could present a hazard with this thing on. 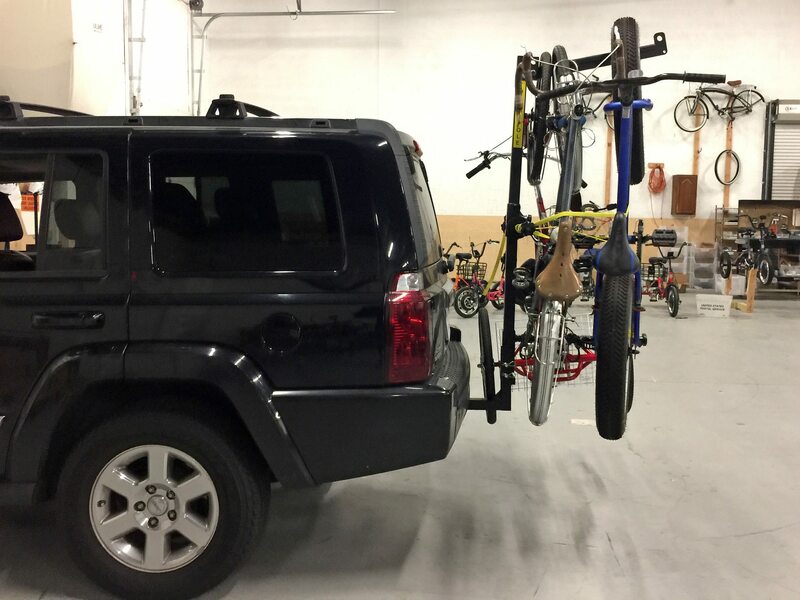 There’s always some sort of trade-off when mounting bikes to the outside of a car and in my experience the platform tray racks can have wheels sticking out horizontally while roof mounted racks (even those with the front wheel removed) drastically increase height. Ultimately, very few if any of these more traditional solutions can accommodate as many bikes as the TP6, or as varied of frame types. 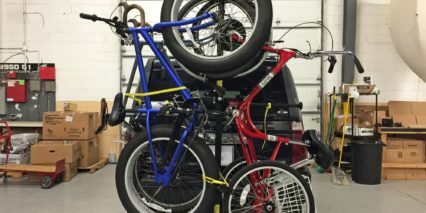 Remember, you can carry kids bikes, road bikes, mountain bikes, fat tire bikes and even some recumbents, tandems and trikes as well as traditional step-thru’s without the need for a crossbar adapter. 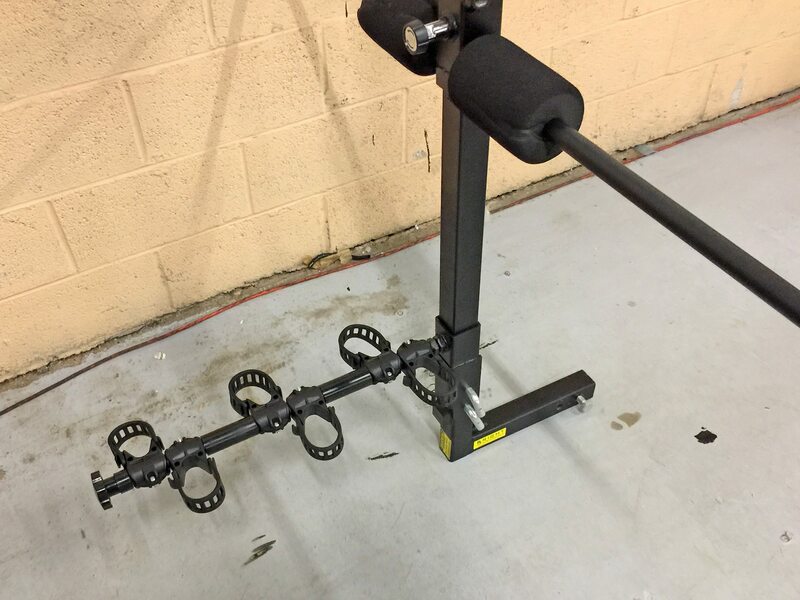 As I get older and see more options for deep-step designs where you don’t have to swing your leg over the frame of the bike, I’m at once delighted but also concerned about how to transport the bike… but that’s not an issue with this rack at all. So aside from the taller footprint, what are my other concerns? 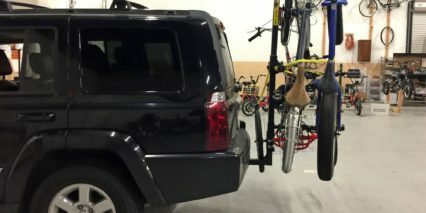 Well, the bikes may or may not block more of your rear view through the back window. Same goes for your backup camera, if you have one. You may be able to see more from side to side but the middle section is likely going to be fairly crowded. 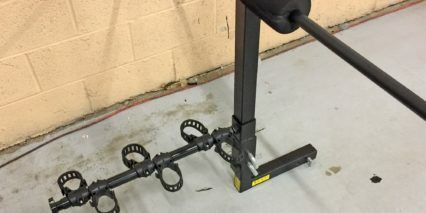 The rack is also a bit heavy at 47 lbs and might require two people to install and uninstall because it’s so long and unwieldy… frankly, it’s visually intimidating for me as a 5’9″ guy weighing in at ~135 lbs, but it’s actually not as difficult to work with as it appears. You just need a plan and a place to put it down. That’s the other tricky thing here, it’s large whether it’s on or off the car and you might have to take it off every time you pull in to the garage (if you have a garage). 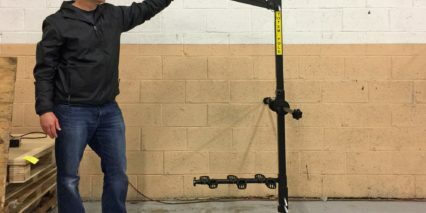 Thankfully, the guys at Upright Designs have addressed this use case with an optional floor stand for $90. 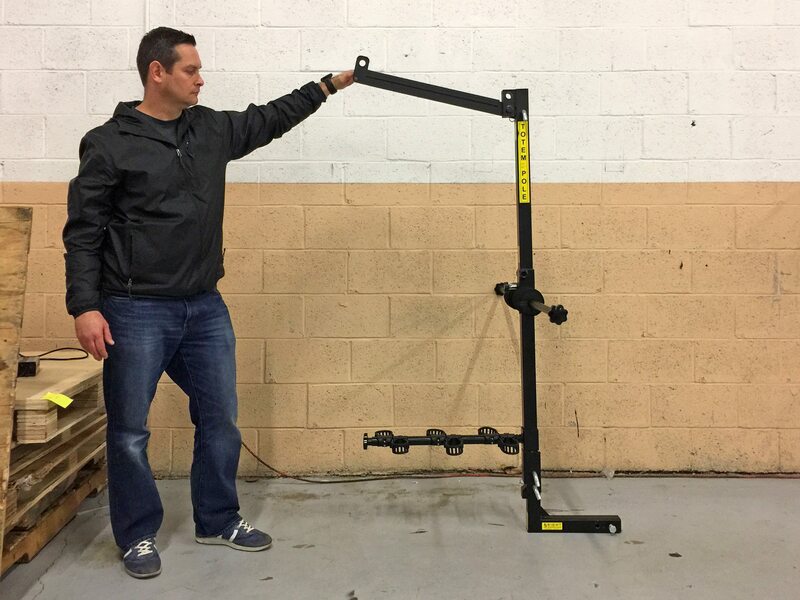 Just take the rack off your car then mount it on this adjustable three-legged dock then hang your bikes back up. 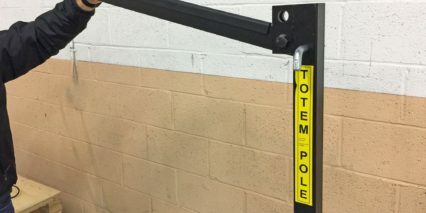 Very cool idea, you might be interested in the Totem Pole bike rack just for this feature because house space may be limited or you might not be allowed to screw anything into the walls of a rental space. 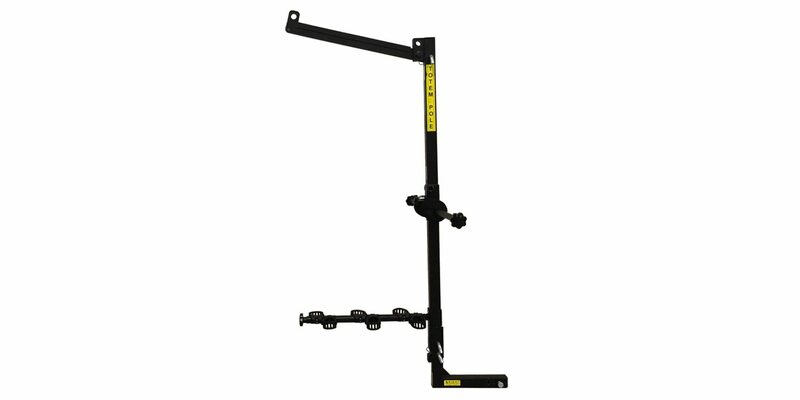 Note that the TP6 only comes in a 2″ hitch design vs. the smaller 1.25″ which many sedans and smaller cars offer. One final complaint or consideration here is that you have to tip bikes vertically then literally lift them up into the air in order to hang them on the rack… for people with 50 pound electric bikes this may be another two-person job and you might not want 6 bikes for fear of bending the rack. 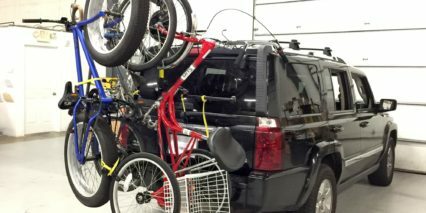 They say it holds up to 200 lbs so that’s about four standard ebikes… not six, but then again Jason hung on the rack and he weighs upwards of 200 lbs and we already had three bikes on it. Hanging bikes isn’t very difficult once the bike is up, just slide the front rim onto the big rubber-coated horizontal pole at the top and you’re nearly done. 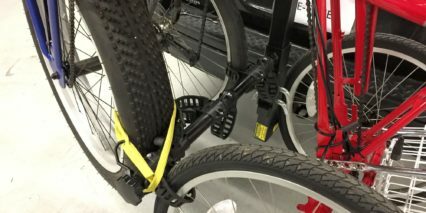 Latch the lower wheel in with the rubber straps (which can be a bit tricky if your hands are cold) and you’re on to the next bike. Perhaps ratcheting straps would be an improvement with future models vs. the rubber straps. The rubber straps require more hand strength and fiddling than I’d prefer and can be tricky to reach once multiple bikes are mounted. 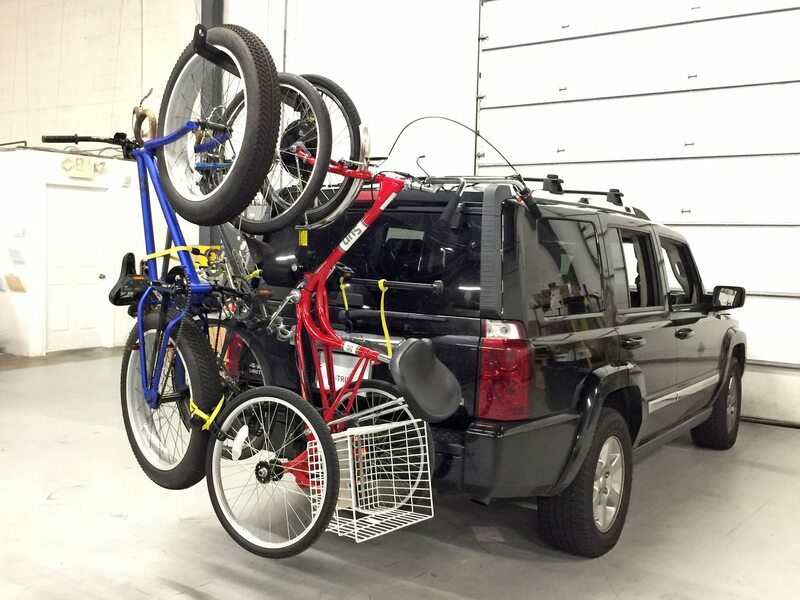 At the end of the day, for $400 you get a very unique, well designed bike rack that can haul more bikes than the competition without increasing the drag of your car or strain on your pocketbook the way a multi bike roof rack plus rear rack combination would (in order to haul the equivalent 6+ bikes). The TP6 comes from a family that loves cycling and the name they chose is fun while offering a friendly nod to indigenous people and First Nations of the Pacific Northwest, North America that built wooden totem poles for cultural and ceremonial purposes. 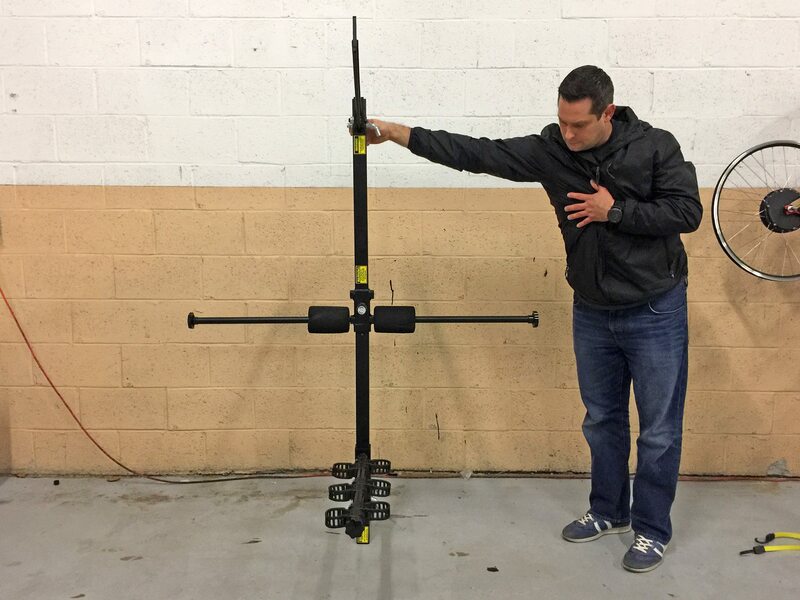 As someone who rides daily and lives in a culture bicycles… enjoying the community, health and environmental benefits they provide, this rack offers something special. Traditional totem poles often told the story of family groups whereas this modern “totem pole” helps family create new stories together. 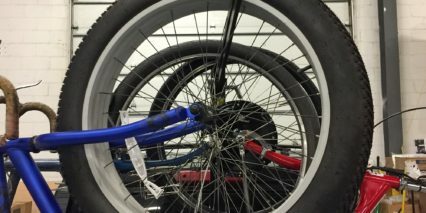 Whether you’re part of a large family with a variety of bike types, a person with a unique or special-needs bicycle or trike or someone who needs a dual-purpose solution for indoor storage and transport, it’s really great to see a product like this that is up to the task… and while there are some definite risks associated with the vertical design, strength and security are not amongst them as long as you mount the bikes properly and apply the appropriate locks and security measures. I hope this overview helps you understand the TP6 and consider it amongst the many types of racks now available and I wish the founders and their families many more great rides together. Much respect to Fist Nation groups the world over whose traditions have inspired creativity in designs like this, especially those who enjoy cycling and have helped to preserve our natural world. 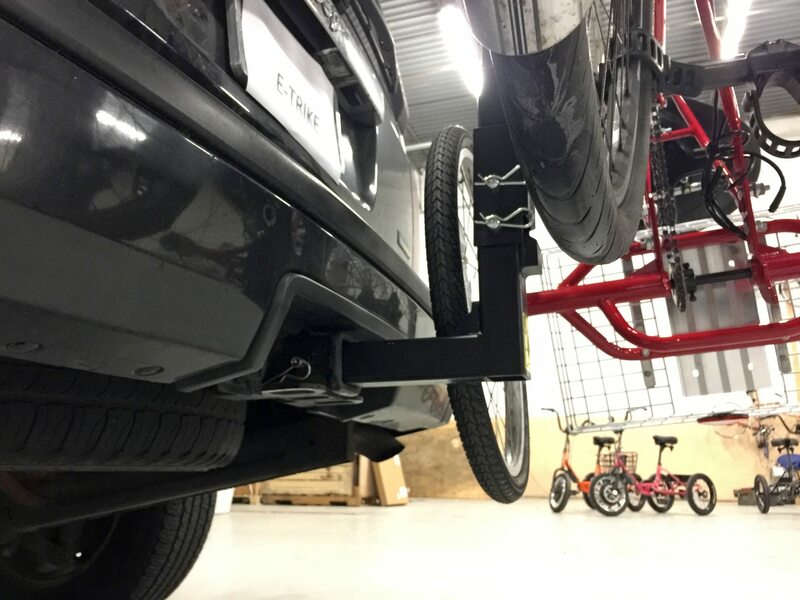 The company sells two very useful accessories including a 6″ vertical extension that keeps your bikes from hitting the ground or getting too close to the exhaust pipe (depending on your car’s design) as well as their floor stand which converts the rack into a bike holder in your garage!